I think there's a lot of confusion regarding bronzing, contouring and highlighting. Bronzing does not equate to contouring. When you bronze yourself, you give yourself something of a fake tan and a sun-kissed glow. It subtly changes your skin color but does not make your face skinnier or your bones more pronounced. In reverse, highlighting and contouring subtly alters your facial structure but does not alter your overall skin tone the way bronzing does. It's important to separate the two because so many people end up buying the wrong product to do the wrong job when they get it mixed up. People who have slightly oilier skin or don't like cream products to slide around on their face. People who want subtle contouring and highlighting that looks natural enough for day-time wear. People with relatively clear skin at the cheeks. If you have lots of marks and pitted scars to conceal, I don't recommend doing this. 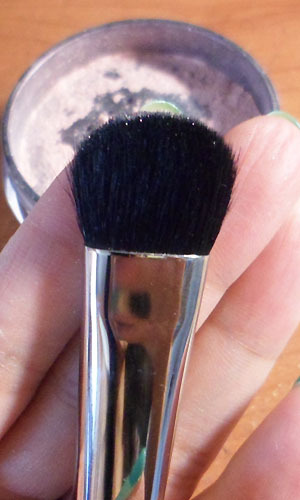 MAC 227 shadow brush: perfect for smoothing on highlighter. I'm using a slightly shinier highlighter and a deeper contour powder than I wear on a day-to-day basis because my camera will not pick it up otherwise. A powder highlighter: If you are pale to light skinned, get something pink-toned (I used MAC Silver Dusk Iridescent Loose Powder). If you have medium to tan skin, go for a peachy shade. If you have deep-toned skin, go for a real bronze-y or coppery shade. 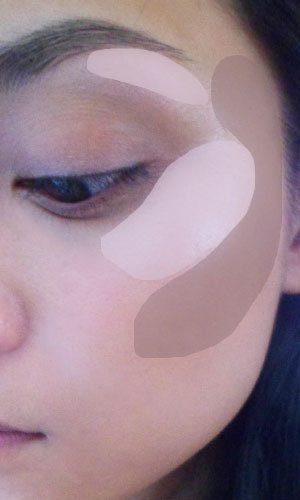 Matte contouring powder: Make sure you get a color that looks like the color of the shaded parts of your face. This means your skin tone but 2-3 shades deeper. This does NOT mean any redder, or yellower. Step 1: Start with foundation or whatever base you use. Conceal any discolorations if you need but know that you might need to touch up afterwards as your contouring and highlighting may remove some product. DO NOT SET WITH POWDER AT THIS POINT. Step 2: Apply your highlighter thickly along the brow bone, and then along the cheekbones. Be generous with your highlighter. This is going to get faded out and blended when you apply all your other products later. Also, start the highlight much higher up on the cheekbones, almost right under the eyes. See below image for the whole area where you should pack on highlighter. This lifts your cheek bones and allows the sheen to catch the light better, so you get that polished perfect-skin glow. Warning: If you have a lot of laugh lines at the outer corners of your eyes, avoid going up that high of course. Step 3: Contouring. Use a small face powder brush for more control and color intensity. The darker matte powder should "cup" the highlighter earlier and curve in at the outer corners of your temples in a rough C. If you want to sculpt and lift your cheekbones, you should always run your contour just slightly higher than the actual hollow points of your cheeks. If your lower cheeks are a little chubbier than you'd like, you can also lightly dust the remaining contour powder down towards your jawline. By this time, your highlighter should have become quite subtle from the brushing (above), and your contouring should not look like any hard stripes. Step 4: This is optional. If you want a flush, just pick up your regular blusher and lightly dab from the cheekbones INWARD along the line where your highlight and contour meet, until you end at the apples. I say go inwards because placing your brush onto your apples first will leave you with a big patch of pink or red on your apples, when your blush hits the moisture of your base. If you place it along the cheekbones first, the skin there has already been set with a layer of highlighter and contour powder, and you should have just a small amount of blush left by the time you reach your apples. Otherwise you will need to blend out the red patch with loose powder. Step 5: Optional as well! Touch up any concealer lightly where needed, but don't go overboard unless you want a matte beige spot on a dewy pink cheek. Finish by dusting setting powder all over IF you need to bring down the sheen and color a notch. I mostly just skip this and apply setting powder only in the center of my face. 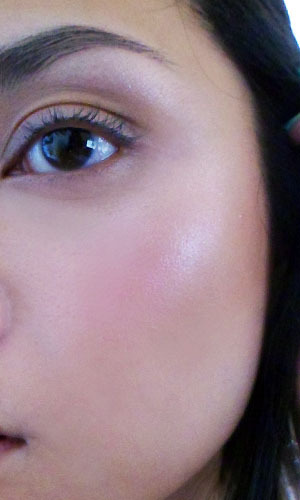 Contoured, glowing cheeks that look like dewy skin but don't FEEL sticky or oily at all. It's truly amazing the difference a good contouring makes.